Is your heart full? Do you feel the weight of His love pressing on your heart until it seems it will burst into a million pieces? There are days where I do, but more often there are days where it goes unnoticed. This Lent, all of my grand planning has but one goal - to empty myself of me to make more room for Him. Some of the emptying is bodily (via our Whole30 discipline). Some of the emptying is environmental (via the 40 Bags in 40 Days). Some of the emptying is mental (via the phone fast in the evenings). All of the emptying is so I can let the love of Christ be what fills me. I empty myself of convenience, of laziness, of me, and learn to depend solely on Him - to trust His Word and His promises, to rely on His providence, to fall on His grace to comfort and sustain me when it gets tough. I can never experience the greatest magnitude of His glory if I design my life to be one of comfort and convenience, where there is no struggle, no effort, no affliction. So I enter into Lent with great plans I know will likely fail at some point, because I am human. I enter in trusting that my earnest effort will please Him. I enter in with the hope that as I empty myself of me, the Lord will fill my heart to burst, so that it cannot help but overflow into a Love-starved world. I enter in with a great desire to pass that thirst for the love of the Lord into the hearts of my children, along with the desire to pour out that love upon others. 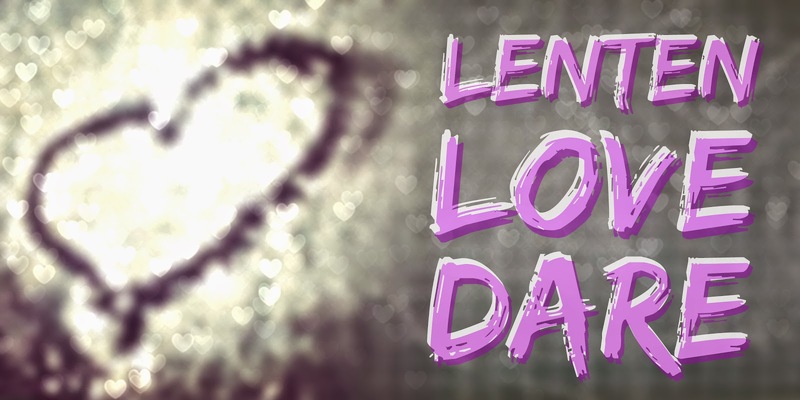 I invite you to join us in this great Lenten Love Dare. I haven't figured out all the details as of yet, though I trust the Holy Spirit will guide us at his own pace. What I do know is that each week, our family will be focusing on a group of people suffering affliction and attempting to pour out love upon them. Prisoners, soldiers overseas, terminally ill children, the elderly, the homeless...people at risk of feeling discarded by society. Through creating spiritual bouquets, collecting prayer aids, and however else the Holy Spirit leads, we will share the love of God. We will let people know that they are not forgotten. We will remind them that their lives have meaning. We will share with them what we know in our hearts: God has created each of us for a purpose. 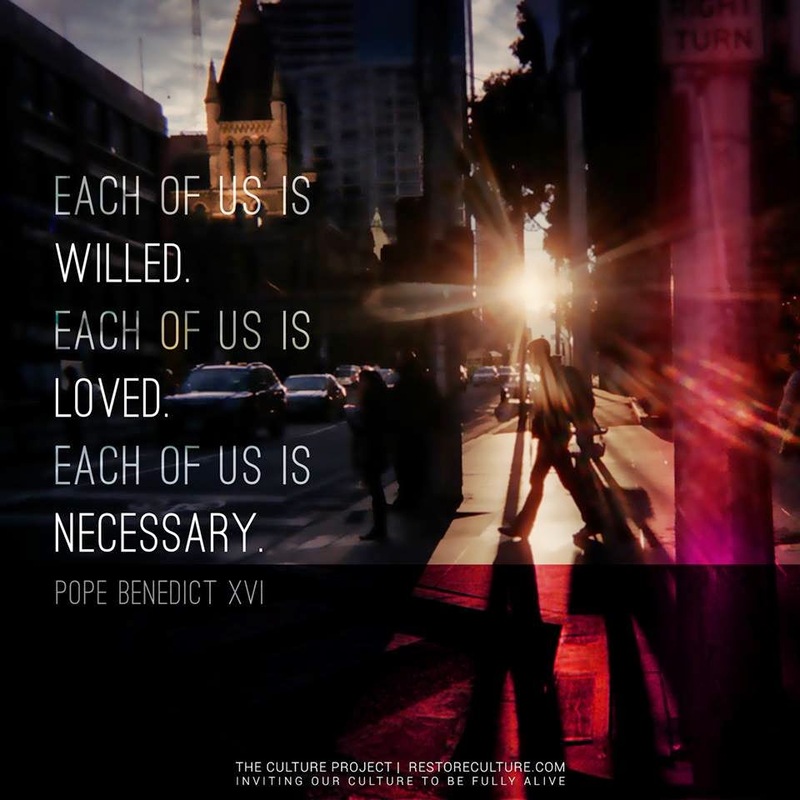 In the words of Pope Emeritus Benedict XVI, "Each of us is willed. Each of us is loved. Each of us is necessary." As I iron out the specifics involved, I will share our weekly projects. I triple dog dare you to join us! Let's get out there and love 'em like Jesus!